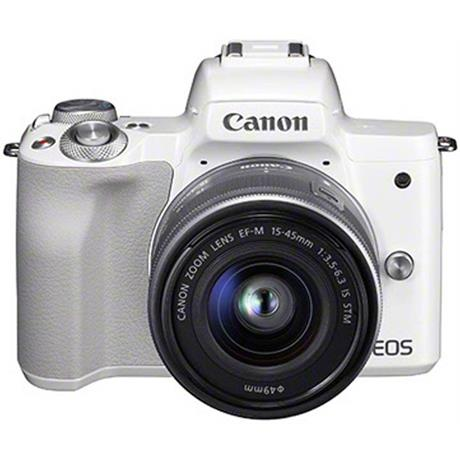 The Canon EOS M50 with 15-45mm Lens offers high-end features and DSLR-style control in a portable and sophisticated package. The M50 is built around a 24.1-megapixel APS-C sensor with Dual Pixel CMOS AF and a powerful DIGIC 8 processor, which allows for beautiful stills and cinematic 4K video with 5-axis image stabilisation. There is also Wi-Fi and Bluetooth connectivity. Packed with innovative technologies, like powerful DIGIC 8 processing, Dual Pixel CMOS AF and 4K video with 5-axis image stabilisation, this portable mirrorless camera lets you make smooth, memorable cinematic movies and sharp, hassle free photos straight out of the camera. A modern classic this sleek, compact camera delivers a refined, intuitive shooting experience thanks to a large central electronic viewfinder. Use Touch and Drag AF to control focus, while using the EVF, and be ready to shoot in any situation with a 7.5cm Vari-Angle touch screen. Quickly connect the camera to your smartphone using Wi-Fi and Bluetooth. Automatically send images to smart devices and PCs with auto image sync and transfer - for instant sharing on social media or cloud backup to irista. Download the Camera Connect app for remote camera control. Do your stories justice. Automatically capture superb photos and 4k movies full of detail and colour with extensive high tech features. An APS-C sized 24.1 Megapixel CMOS sensor delivers great low light performance and beautiful depth of field control. Catch fast action with 10 fps continuous shooting. Experience creative flexibility with the compact, high performance EF-M lens range, or for ultimate choice and versatility embrace over 80 lenses from Canon’s renowned EF and EF-S ranges via the Mount Adapter EF-EOS M. Easily attach Canon Speedlite flashes to explore flash photography.